Over the past several years, B2B marketers have been expanding the role of lead nurturing as a key element of their marketing initiatives. 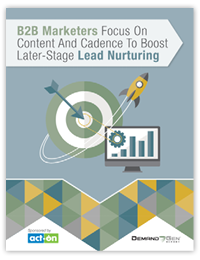 In Demand Gen Report’s 2014 Lead Nurturing Benchmarking Study, 71% of respondents reported that they are using lead nurturing as part of their demand generation activities, and another 19% plan to within the next 12 months. While lead nurturing programs have traditionally focused on generating leads at the top of the funnel, progressive B2B marketers are developing lead nurturing strategies to drive demand in the later stages of the buyer’s journey. Fill out the form below, and learn how to enhance your lead nurturing initiatives for the later stages of the buying cycle with quality content and meaningful messaging.